Football star Peyton Manning ruled out a bid for the U.S. Senate seat being vacated by the retirement of Republican Bob Corker, saying in a sports radio interview on Wednesday that he is giving "zero consideration" to running. "I certainly have an interest in politics and in our country," the former NFL and University of Tennessee quarterback told WGFX-FM. "I just have zero interest in being a politician." "Is there a chance down the road that he can be enticed to run for the United States Senate or something like that? I hope so," Corker said. 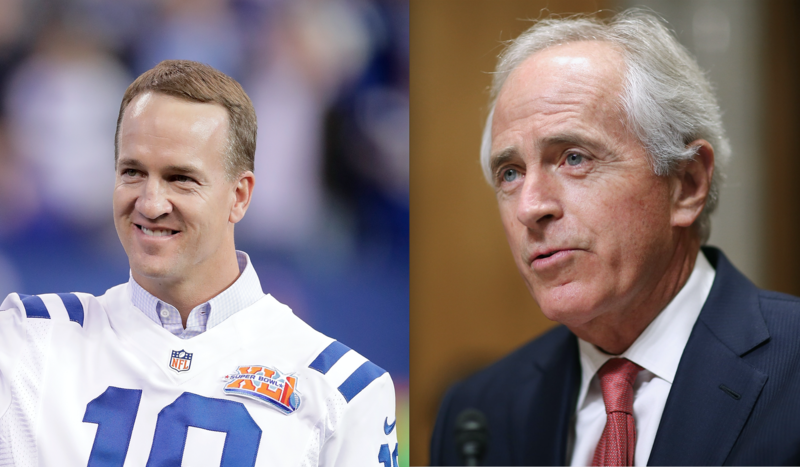 Corker said Manning texted him after his retirement announcement Tuesday to plead with the senator not to "fan the flames." Manning's political future has long been a source of speculation, especially after a highly publicized golf outing with President Donald Trump and Corker earlier this year. Manning also attended a Republican congressional retreat. Haslam, who can't run for governor again next year because of term limits, has not responded to questions about his plans now that Corker is retiring. "While I don't think Haslam has any burning desire to run, I think he understands the importance of the office and of public service," Ingram said. "Bob's leaving big shoes to fill, and I think it's going to take the right person to fill them. I hope the right person will step up to it." "One hundred percent, no," he said. Pressed specifically about his Senate plans, Haslam said: "I love my job, thanks." The only Republican who has declared for the Senate race so far is Andy Ogles, the former state director of Americans for Prosperity, the political arm of billionaire brothers Charles and David Koch's network. "Energetic free-for-all primaries are good for the party and will produce a nominee who is ready to take on the Democrats in November," he said.